Join us to learn how it benefits sustainable and small –scale farmers in Missouri! It has several programs that can benefit you, including: Programs that foster the next generation of farmers & foster inclusion and equity: Beginning Farmer and Rancher Development Program, Conservation Reserve - Transition Incentives Program, and Outreach and Assistance for Socially Disadvantaged Farmers and Ranchers Program (2501). Programs that spur economic development, regional food systems, and food access: Farmers Market and Local Food Promotion Program, Value-Added Producer Grants Program, Rural Microentrepreneur Assistance Program, Food Insecurity Nutrition Incentives. Programs that support farmers to supply the expanding organic market: Organic Agriculture Research and Extension Initiative, the Organic Production and Market Data Initiatives, and the National Organic Certification Cost Share Program. Programs that protect farmers' soil and water resources: Conservation Reserve Program, Environmental Quality Incentives Program, Regional Conservation Partnership Program, Agricultural Conservation Easement Program. The event is free and lunch will be provided. 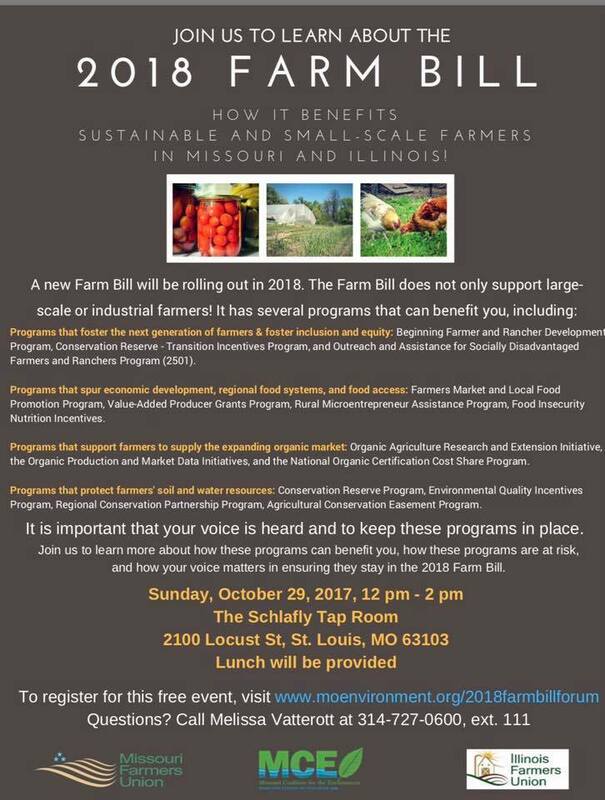 Register here so we can order enough food: www.moenvironment.org/2018farmbillforum.